Elevation Profile: A lot of up and down. Total climb of about 2000 vertical feet with 3000 feet of descent. Distance: This tour can be performed in a variety of ways. The option described covers approximately 3.5 miles round trip. Special Considerations: While riding fatbikes around the ski area you should be aware of snow machines and grooming operations involving winch cats. Also know that NO avalanche mitigation work has been performed by ski patrol before 9am. The Monarch Uphill Policy can be found by clicking Here. This is one of my all-time favorite tours. It covers a huge amount of terrain while travelling along the continental divide on Monarch Pass. The slopes are all pretty mellow but they are super fun and the snow is consistently good. One of the coolest things about this tour is that it starts and ends at Monarch Ski Area, so you will have access to food, a heated lodge, and tasty beverages at the Sidewinder Saloon afterwards. I should note that in order to complete this epic adventure you will need a lift ticket to Monarch Ski Area. 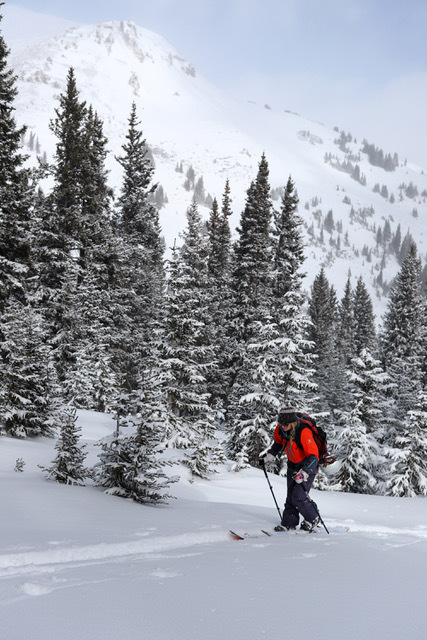 Proper avalanche gear is also required, however the overall risk is generally low. If you arrive before 9am, then you can ride around the area on your fat bike to get the day started. I highly recommend this. We rode out the groomed egress road to the base of Mirkwood Basin which was about a mile out and back and gave us a good view of the main bowl and Elation Ridge. Please respect the rules here and finish your bike ride before the lifts start turning at 9am, and also beware of snowcats still working on the mountain. Let’s not ruin this privilege for others. The first part of the tour starts with a hike up to the top of Mirkwood. On a good day, Ski Patrol will have this open by 10am. This means that you have a little time to kill, so head inside the lodge for a hot breakfast burrito and some coffee. You are gonna burn a lot of calories so you might as well stock up. Also nice to change into ski gear inside the comfort of the lodge. Now it’s time to grab your skis or splitboard and head to Breezeway chair. The bootpack starts right behind the patrol shack up to the top of Mirkwood which offers a variety of short but sweet pitches. I recommend East Trees or Staircase for some rad cliff drops and chutes! All of the runs in Mirkwood filter into the groomed egress road that you rode bikes up earlier. Take this back to Breezeway chair and ride up for a cruise down Outback or Shagnasty. Make sure that you tend to the right here so that you end up at the Panorama Chair. This is one of my favorite lift rides in the state as it cruises through forest and stays mostly protected from wind. There is a local porcupine that lives up in this canopy, so keep your eyes out for him. At the top of Panaroma lift you should make sure that your beacon is on because it is time to head off piste and into the backcountry. Head North on the cat track towards High Anxiety Trail and you will find the newly formed backcountry access gate on skiers left. This takes you into a really great set of gladed trees referred to as OOTS. There are lots of great lines through here so enjoy the ride. Eventually you will end up at a distinct road cut which is the old Monarch Pass Road. The cut bank can be thin here, so ease your speed. DO NOT drop below the road. Stop here and put your skins on because it is time for the longest skin of the day. Moving South on Old Monarch Pass road will eventually take you to the crest of the pass where you will see a USFS Continental Divide sign. The road will curve to the East, but you will want to split off and start to blaze your own trail. Continue due South over the first pitch known as Pass Bowl. You will come back to this later. But for now, keep skinning down to a saddle and up the next pitch to the top of Snowstake Bowl. At the top you will be greeted by Tibetan prayer flags and a nice flat area to convert back to downhill mode. This is a great spot to survey the landscape. Far to the North you will be able to see the top of Mirkwood Basin, where the tour began. Drop into Snowstake Bowl and enjoy some nice gladed tree skiing. Hold your speed at the bottom of the pitch to cross the creek bed. The skin track you are looking for is just on the other side. Take this back up to the saddle and break off to skinner’s right. A short push will take you to the top of Pass Bowl. The left side of this slope is heavily wind effected. All sorts of cool wales and lips are crated behind the various tree islands. Enjoy the ride down the frozen wave, but be weary of big airs to flat landings. Across the meadow at the bottom you will see the Old Monarch Pass road once again. Hop on it and start cruising downhill to the East, towards HWY 50. In about ¼ mile the road will start to parallel a green trail at the Ski Area known as Roundabout. There should be a gate here to re-enter the ski area. Continue travelling along Gunbarrel Ridge to the top of Gunbarrel Run. You will have a short hike to get here. At this point your legs will be a bit tired from the day so the short but sweet pitch will seem more difficult than it really is. I like to try and shred from top to bottom without stopping. The run finishes back in the Monarch parking lot. Take your boots off, put on a fresh pair of socks, and head inside to the Saloon for a massive plate of Nachos and some cold beverages!